So you have your travel capsule wardrobe sorted based on your destination. But what if getting to your destination means spending some quality time in the car? I’m not talking necessarily about a super-long road trip. I’m talking about the quick getaway that involves hiring a car when you step off a domestic flight. It’s about getting out of the city and exploring a local beach or hinterland region you may or may not have explored before. When it comes to the what to wear on a road trip question, these tips I learned along the way might help you. Wear clothes you’d happily sit in for hours at a time. I know this seems obvious but you could be flying for up to six hours and driving for two-three hours. You need to have clothes that are super comfortable. Think elasticated pants, leggings and relaxed dresses. Wear flat, comfortable shoes. I like to slip my shoes off when I’m a passenger in a car, so shoes that do that easily are a must. I also need those same shoes to be safe and comfortable for driving. Opt for clothes that don’t crush. This is a good motto for your whole wardrobe but even more so when on the road and living out of a suitcase. This means I never look crumpled after a day of driving. Be prepared with garments you can layer. The temperature ranges you can experience can vary dramatically, depending on your destination (and how long you’re in air-conditioning). A jacket – leather or denim – and a light knit will serve you well. Wear sunscreen and sunnies – AND have your hat handy. Don’t rely on window tinting to prevent you from getting sunburned while driving. And have your hat easily accessible to pop on when stopping for breaks along the way. I just love that you can hop on a plane anywhere in Australia and be somewhere totally different in a matter of hours. Sure, the same amount of flying time could see you cross several countries in Europe but here that travel time means the opportunity to see and visit somewhere quite different from where you live. The below is a very personal list – places that I’ve visited in the past few years and can highly recommend based on those visits. 1. Southern Highlands, NSW: My blogging friend Beth lives in this picturesque part of Australia. The fireplace is on almost every day of the year, which is a big drawcard for me. The region is lush and green. There are distinct seasons too. My pick would be autumn or spring for their visual foliage and floral feast. If going at Easter, don’t miss the Burrawang Easter Markets. You’ll see why this area is home to so many wonderful food producers and artisans. 2. Tasmania: I’ve only visited Tasmania once and it was a crazy three days of driving and soaking up as much as I could. We scratched the surface as to what’s on offer. You can see a lot over this shorter period but if you have longer then you can make it a relaxing and re-energising stay. The food, the nature (and walks), the gorgeous B&B-style accommodation, the wineries and the culture of our southern-most state, make it an escape to remember. Fly in and drive from: Melbourne (boarding the Spirit of Tasmania with your car); Launceston or Hobart. 3. Far North Coast, NSW: Take your pick along this section of Australia’s coastline. Byron Bay, Kingscliff and Cabarita are faves of ours. The beach and the hinterland are equal drawcards here. You’ll find accommodation and food options to suit all budgets but if you can swing a luxe escape then Halcyon House is a must-stay. Fly in and drive from: Ballina (30 minutes*); Coolangatta (50 minutes*); Brisbane (2 hours*). *Note these times are to Byron Bay. 4. Sunshine Coast, QLD: My old home-town offers some of the best beach and hinterland escapes in Australia (I’m only a little bit biased!). Noosa offers sophisticated charm alongside stunning coves. Other spots like Cotton Tree, Mooloolaba and Caloundra are firm favourites for many. The hinterland offers boutique accommodation and a commanding view back over the Coast. All budgets are catered for. 5. Central Coast, NSW: As a Queenslander, I would not have discovered this part of the world had it not been for my blogger friends. The coastline is stunning. The pockets of residential and holiday accommodation areas are surrounded by national park and you have great dining options for all budgets. A lunch on the verandah at Bells at Killcare is a must. Love the charm of Pearl Beach too. OF COURSE, there are many more Australian fly-drive destinations worth of a visit. Many I’ve visited years ago and need to add to the list to re-visit (Margaret River, WA; Great Ocean Road, VIC; Adelaide Hills, SA; Port Douglas, QLD … I’m looking at you). But I want more fly-drive ideas and that’s where you come in. Share in the comments below your favourite non-city escape. Maybe you don’t have to fly to reach it. Maybe you live in a region that we need to add to our wishlist. Share away. So, here’s the thing. I had never considered taking out travel insurance for a holiday here in Australia. Never. Yet, when I started to delve into it, I discovered that there are many reasons why it’s a very good idea. And I’ve been buying it ever since. This is kind of a funny (not at the time) story with a great ending that sealed the deal for me. In January, during our annual escape to beach, Mr SY thought he’d had his surfboard stolen. By the time, we were about to put in a report to the police, word had gotten around to our friends staying nearby. My husband got a text from one of them. HE had the board ready and waxed for the next day’s surf. Only thing is, he’d meant to text Mr SY but had forgotten it the aftermath of the New Year’s Eve festivities. Crisis averted. Mood lifted. Laughs were (eventually) forthcoming. Like for my international holidays, I choose Allianz travel insurance for my domestic escapes. Each time it’s not only simple and easy to obtain the insurance I need – I selected and purchased my cover online – but also the insurance that was competitive in price for the inclusions. In short, I now don’t leave home – or book a holiday – without it. *Discount based on standard premium rates and applies to Domestic Comprehensive policies only. Please note some discounts may have already been applied to premiums when a product is purchased through a certain channel (for example, online) (Original Discount). In such a case, the greater of the discount offered under this voucher and the Original Discount will be applied. Discount applies to standard premiums only. No discount will be applied to other premium components such as pre-existing medical condition cover. 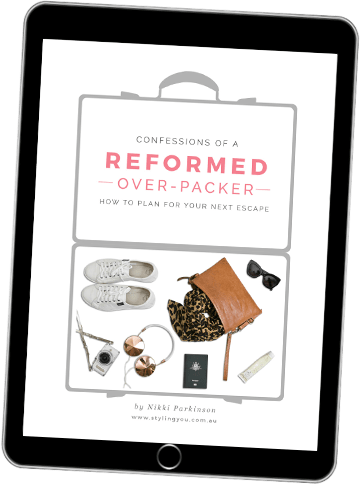 Want more travel packing and planning advice? Simple tips to help you plan and pack for any travel destination or situation. What clothing, footwear and accessories should take up the most space in your suitcase? How to minimise your essential beauty product kit. Which extras should you invest in to make your trip away less stressful? Specific capsule travel wardrobe advice and examples for multiple destinations. Advice for domestic getaways – weekends away, a beach holiday, road trips and conferences. Advice for international getaways – northern hemisphere spring, summer, autumn, winter, tropical and sub-tropical island destinations. Advice for what to wear on a flight – short and long haul. Why travel insurance is as essential as your passport. A printable checklist to help you pack and plan your next trip. Love the Central Coast and visit often – we prefer to fly into Newcastle and drive as it’s usually quicker and cheaper, with a lot less traffic. And yes, I always have travel insurance. I buy an annual policy as I travel a lot. It was very handy when my rental car was damaged by an unexpected hail storm. Flying into Newcastle is a very good idea Mel! As is the annual policy – just had an ah-hah moment!! Have you used the Xander backpack? How did you find it? Sorry, I missed this comment. YES! I took it to Europe with me. Was so good having hands free at airports etc. And doubled as a beach bag for days at the beach. Sure, you could visit the Great Ocean Road when in Victoria- the scenery is pretty spectacular, but you should combine it with a trip inland and make it part of a road trip of Western Victoria. The Grampians are great for walks with October being a great time to visit for the wildflowers. Or you could add a few extra layers and head to Ballarat now where we really embrace the cold with our Winter Festival, with its combination of great food, drink and activities such as a pop up ice skating rink and special events at Sovereign Hill :). My next trip though will be north, to Cairns- there is only so much cold I can take! Oh thanks so much for your suggestions! Love the sound of this. all good suggestions thanks nikki! … comfort first! and we are covered! we will be coming your way Thursday week, for our yearly trip to visit my daughter! so as not to inundate for 7 weeks we’re taking a sojourn to hervey bay for 2 weeks! going up on the greyhound and back on the tilt train, for a bit of variety! planning to see the whales too! travelling light hun! … the perth trip was an excellent reminder how much I don’t need to take! we did well! … proud!